Dental Implants – Replace missing teeth with a stand-alone option that can last for life. They strengthen your jaw and promote a healthier biting relationship. Crowns and Bridges – Cover or replace badly damaged teeth so that your bite can continue functioning properly. Root Canal Therapy – Prevent loss of your natural tooth by restoring it from the inside out. Wisdom Teeth Removal – Signs of impacted wisdom teeth and early removal can help you avoid pain and infection. 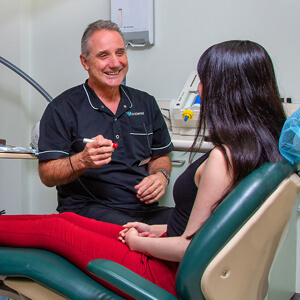 We desire to provide our Menai patients with the information they need to make educated decisions about their dental care. Dr Suster wants your experience with us to be comfortable at all times. Vision Dental is happy to answer any questions that you may have regarding your treatment options. We offer 0% interest free financing available and same-day appointments. Contact us today to book yours!